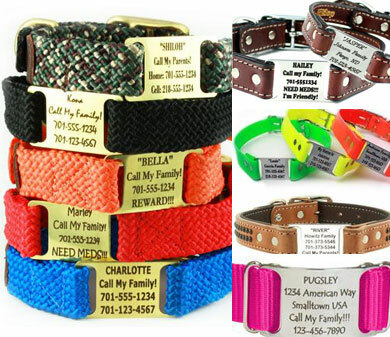 Instead of a pet ID tag, buy a personalized dog collar with your text engraved on a name plate. No jingle personalized dog collars. 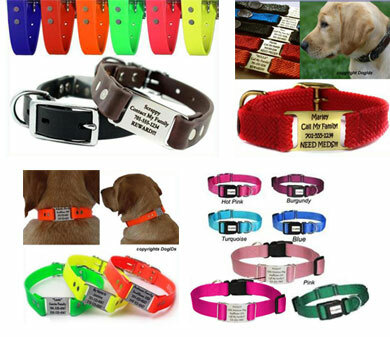 Personalized dog collars with your dog's ID engraved on a name plate or buckle, your dog's name embroidered on the collar, or in bling letters. Matching dog leashes, too. Choose for leather, nylon, fabric, synthetic. Sizes from 6 inch - 34 inch. Free shipping. No jingle personalized dog collars. Replace those noisy, metal ID tags with a beautiful personalized leather dog collar. 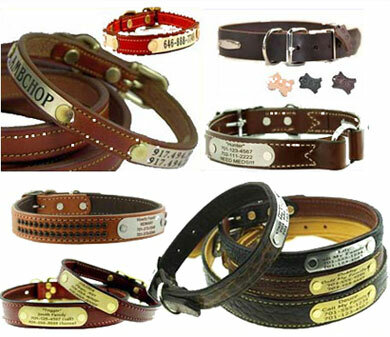 In this category you'll find uptown personalized designer dog collars as well as affordable custom leather dog collars. From classic brown and black leather, to hot pink collars, red leather collars, and many other colors and designs. With most of these collars, matching leather leashes are available, too! Laser engraved name tags, riveted on the collar, and collars with built-in ScruffTag™ nameplates. In a wide variety of sold fashion colors and materials; from ribbon and nylon to double braid, velvet, waterproof synthetic, or reflective. Personalized Sunglo collars, too! With so many styles, colors and patterns to choose from, you're sure to find one of these custom name plate dog collars to match your dog's unique personality just right! And with most of these collars, matching dog leads are available. Beautiful personalized designer collars in nylon, ribbon dog collars. From striped dog collars to collars with skulls. From polka dots to Maya designs. 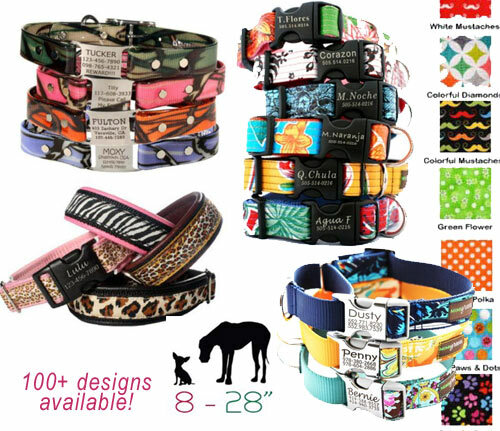 With so many patterns and designer fabrics to choose from, you're sure to find one of these personalized buckle dog collars to match your dog's personality just right! With most of these collars, matching dog leads are available. Designed by DogIDs, the patented ScruffTag™ Collars. They are practical, stylish, durable, and unlike dangling ID tags: they're silent. And best of all: the personalized name plate sits right on the back of your dog's neck at all times! Right on the scruff of your dog's neck so people can easily read your contact information without physically contacting your dog. With most of these collars, matching dog leads are available, too! Replace those noisy, metal ID tags with a beautiful hand embroidered personalized dog collar. 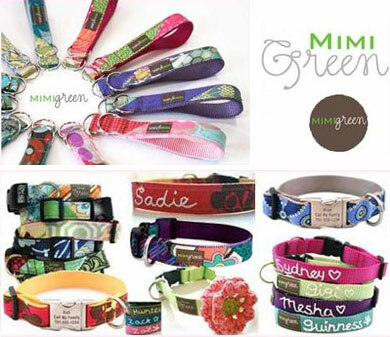 These custom collars from the Mimi Green collection are the pick of the litter. Each collar is one of a kind since it is hand embroidered with your dog's name, your phone number (optional) and an extra embroidered decoration (optional). Your dog will feel special in its personalized collar. Mimi Green Designer collars are handmade in the USA. Matching leashes are available, too! Each of these embroidered dog collars is constructed of super strong webbing with attractive fabric overlays, sewn directly onto the webbing. Practical, durable and stylish. There's a leather dog collar that can be custom embroidered, too! With so many styles, colors and patterns to choose from, you're sure to find one of these custom dog collars to match your dog's unique personality just right! With most of these collars, matching leads are available. Whether you are looking for the latest in doggie bling bling fashion or trying something new, you will love our wide selection of personalizable bling dog collars. Perfect for strolls and adventures, boardwalks, and yes, for "catwalks", too! Matching leashes are available, for most of these collars. If high visibility is a top priority for you during those evening walks, you will love our personalized reflective collars! Choose between a name plate riveted on a reflective collar, or embroidered letters in reflective thread. With some of these collars, a matching leash is available. The perfect combination of safety, style, and technology! 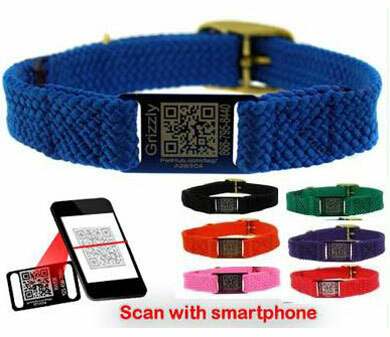 When your custom dog collar arrives, it includes a unique web address and a QR code tag that can be scanned with any Smartphone. The personalized name plate with engraved code offers you the security of knowing your dog has proper ID at all times. Matching leash collection available, too! 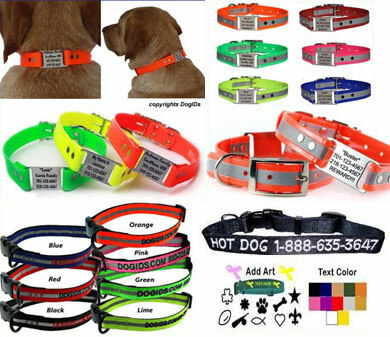 Personalised Dog Collar and Leash collection: Personalized Nylon Dog Collars, Custom Leather Dog Collars, Customized Collars for Small Dogs, Dog Collars with custom laser engraved nameplates, Custom Collar and Leash sets for Big Dogs (Large Dogs). No jingle dog collars. There is just something about having your dog's name and contact info embroidered directly on his collar so no tags to worry about. Or, instead of those noisy, metal or plastic ID tags, buy a beautiful dog collar with custom text engraved on a name plate. Choose for leather, nylon, double braid or other fabric. Many colors, patterns and styles. All sizes, from low priced up to uptown designer. Matching dog leash collections available (see our dog leads and leashes). Nameplates available in stainless steel, polished brass and chrome plated metal. Whether you have a boy dog (male dog) or a girl dog (female dog), a tiny dog, a small dog, a mid-sized medium or a large dog / a big dog, or even a giant dog, we have a perfect dog collar for you. 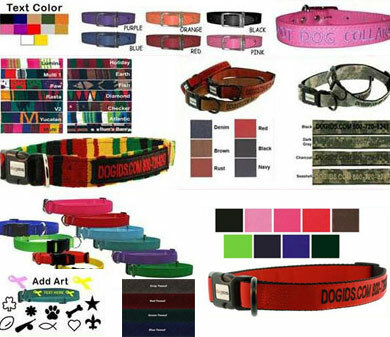 We have nylon collars, leather collars, canvas collars, reflective collars, any style, color or pattern you can imagine! Solid colors, as well as colorful patterns. Handmade designer dog collars, as well as simple and cheap dog collars. In case these custom dog collars are not what you're looking for, have a look at all our different dog collar categories: from leather dog collars to nylon, from simple and cheap dog collars to fancy, fashion, fashionable, cool designer collars and haute couture! Online shopping, dog collar store. Order online, buy your personalized dog collar. 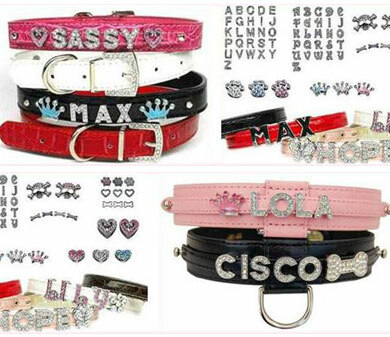 Personalized name plates and embroidery on pet dog collars! Pet ID tags, charms and pendants for dog collars.